When designing a VMware View environment there are many things you must plan in order to find the right solution. The most important factor in regards to performance seems to be disk io. During the past few years the server vendors (IBM, HP, Dell) have adapted their own storage systems. Earlier they OEMed much of their offerings and they still do (from NetApp, LSI Egenio (NetApp), dotHill and EMC), but many of the independent storage vendors has been bought by the server vendors during the past few years (3par, LeftHand, Equallogic, Compellent). On the networking side each of the vendors now have their own 10GbE solutions and most of them are based on Broadcom technology (even Cisco). Cisco arrived as a server vendor quite late, but has come quite heavily into the market as a serious vendor. 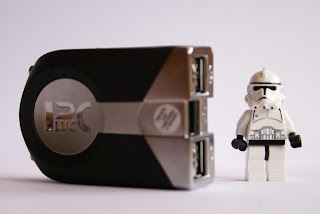 They also have their networking offerings, but lack storage. They have however partnered up with both EMC and NetApp so they also have complete offerings. Through the joint company VCE VMware, Cisco and EMC are offering complete solutions including everything you need in software and hardware with single point of support and s single order line. Each of the vendors also have their own reference architectures for different solution. 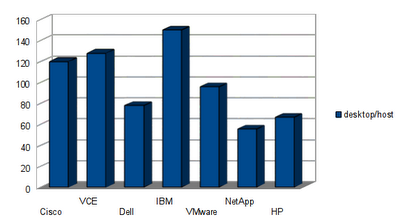 Last week I was reading through some of NetApp's technical reports about Windows 7 and VMware View. While NetApp's document looks very good on the storage side, it's server recommendation seems a bit old fashioned. Storage may be the most critical factor, but that's not a good excuse for not suggesting an optimal server solution. Memory has become cheaper than it used to be two years ago. A VDI environment using hosts with only 48G memory looks to me like a waste of rack space, power and cooling. In my mind it's normally more cost effective to have more memory than that in each server. Each architecture is different and they are also not all using the same versions of VMware View, but all these reports were released in 2011. Some architectures also describes different environments and I've not included them all, only the ones that were the most similar. Some vendors have separate servers for supporting infrastructure (vCenter, View Connection server, etc) and some run these on the same servers as the VDI desktops, so it's not a completely apple to apple comparison. All this does however give an idea of what resources that are normally recommended. In Cisco's document they also increased the number of desktops in their POD (pool of desktops), and cpu was not the limiting factor why it would run slower (not enough memory caused swapping). 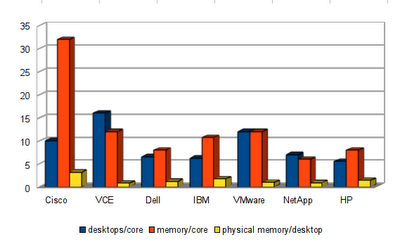 As we can tell from these numbers, the average recommended number of desktops per cpu core is 9. NetApp's recommendation is 7. NetApp wasn't actually worst in class in desktops per cpu core as I first thought, but as NetApp is the only vendor suggesting dual quad core servers (8 cores) instead of dual six core servers (12 cores), their solution requires a lot more physical boxes than the competitors. Their scale out design is probably working fine, but looks like a bit overkill and gives some extra costs both on short and long term. In 2010 NetApp released a 2000 user reference architecture for View 4.0 and here they used servers with 96G ram. 16 servers was here enough to serve 2000 users. Compare that to their 90 servers to serve 5000 users in their latest guide and be confused. "NetApp and VMware View 5,000-Seat Performance Report"
Understanding the HP VirtualSystem for Client Virtualization for VMware View 5"
Interesting that Cisco and VCE have different takes on the number of desktops per core, etc., as well as the amount of pRAM per desktop. It just shows that some of these large companies are in that "one hand doesn't know what the other is doing" rut. NetApp's architecture that you are referring to is not a reference architecture. It is performance testing report targeted towards analysing the impact of desktops in various scenarios (Boot, Logons, Steady State, 2nd time Logons, Boot after maintenance etc.) on the Storage. BTW, I don't see any link to the NetApp document that you referring to in the blog although you have links to all other.